Floor graphic's can go almost anywhere! At Zane Williams we have mastered the applications for Carpets, Tile, Concrete, and Vinyl Flooring. 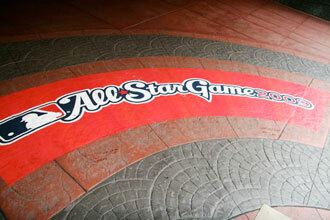 Our custom floor graphics and clings go on easy and remove easy. We always laminate all our decals with a slip resistant laminate so they last as long as you need. They are a cost-effective way to grab customer's attention. It’s especially valuable in driving last minute or impulse purchases. In fact, floor graphics can increase these purchases by 10%! Talk to a Zane Williams representative and allow us to explain how we can make your promotion a great success. 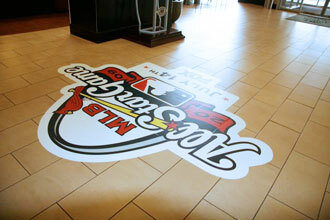 Zane Williams has been producing and printing custom floor graphics for years. We understand the industry tricks, including bold graphics, strong messaging and die-cuts, to get your floor graphic noticed. Plus, we have the printing capabilities that make your graphics durable and long-lasting, so you can reach your most important customers day after day. Contact Zane Williams today to discover how including our floor graphics in your promotional marketing efforts can increase your visibility in today's competitive marketplace.